The Australian dollar has continued its record-breaking march towards the 110 US cent mark, charging through 109 US cents on its way to another post-float peak. At the local close, the dollar was buying 109.09-14, after earlier touching 109.48 US cents, the highest level since February 1982, or almost two years before the dollar was floated. The Australian dollar was also buying 89 yen, 73.5 euro cents and 65.3 pence. The local currency had rocketed more than 2 US cents since noon yesterday because of renewed worries about the US dollar – which has sunk to its lowest in three years against a basket of currencies. The US Federal Reserve gave no indication overnight that it would raise its interest rate anytime soon. Following the five-day Easter and Anzac Day weekend, the local unit resumed its recent rally after headline inflation figures for the March quarter came in at their highest since the June quarter of 2006. Travelex head of dealing Bernie Tuck said the Aussie dollar was due for a pause following the flood of economic news in Australia and the US in the past 24 hours. “The fundamental fact is that the Aussie is incredibly strong at the moment. The US dollar is weak across the board and there is no indication that the US is going to raise rates any time soon,’’ he said. Mr Tuck said the Aussie has also been aided by a huge amount of so-called carry trade, or borrowing in low interest rate-linked currencies, such as the US dollar or Japanese yen, for investment in the local dollar which benefits from higher interest rates. The Reserve Bank’s 4.75 per cent interest rate is the highest in the developed world, said Mr Tuck. Westpac senior market strategist Imre Speizer said market optimism continued to encourage traders to invest in risk assets such as the Australian dollar. “Risk appetite remains intact globally (and) the trend for the Australian dollar continues to be upwards,” he said from Auckland. The US central bank’s Federal Open Market Committee (FOMC) ended its two day meeting early today, after which Fed chairman Ben Bernanke said the bank would complete its $US600 billion ($556.2 billion) economic stimulus plan in June as planned. “The FOMC gave the Australian dollar a bit of a burst by keeping the status quo intact. There were no surprises at all, so the weak US dollar story remains, Mr Speizer said. The Reserve Bank of Australia’s trade weighted index (TWI) was at 79.1, the highest since 1985, up from 78.7 on yesterday. 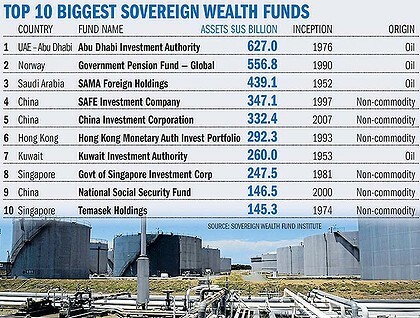 SOVEREIGN wealth funds have enjoyed a meteoric rise, shrugging off the global financial crisis thanks to soaring commodity prices. The value of assets held by these government-controlled monoliths leapt 11 per cent to $US4.2 trillion last year – almost double all private equity holdings. The sector’s value is tipped to hit $US5.5 trillion next year and $US10 trillion by 2015. Resource-poor countries such as Singapore and South Korea have also used sovereign funds to pool public pensions or save their foreign exchange reserves. However, it is commodity-rich states that are most relevant to Australia. According to the International Monetary Fund, almost all the sovereign funds established by commodity-rich countries have one of two objectives: saving the windfall from a boom or smoothing the bumpy ride of commodity cycles. Australia’s Future Fund is a public servants’ pension fund that neither smooths the boom-and-bust cycle nor saves for the nation – and many economists say this is a major gap in our policy settings. Former Reserve Bank governor and superannuation chief Bernie Fraser says we should be storing away the valuable ”nuts” of the current boom. ”We’re just floating by on the commodity boom, giving most of the proceeds back to the mining companies, which are not going to provide the kind of social and economic infrastructure that will sustain this country over the next 30 to 40 years,” he says. When the boom inevitably ends, Fraser says a fund could offset some of the economic pain by having ”social and infrastructure projects developed, on the shelf ready to go”. For others, stability during the cycle should be a key objective of an Australian fund. Mining investment as a share of GDP is already approaching 5 per cent – well above levels reached in the 1960s and 1970s – leaving us more exposed to a sudden slowdown in world demand. For instance, Chile’s $US22 billion stabilisation fund automatically receives budget surpluses of more than 1 per cent of gross domestic product. When commodities tanked during the global financial crisis, a $US4 billion injection from the fund helped limit the worst of the recession. Grattan Institute economist Saul Eslake says Australia should also adopt a fund to accumulate large budget surpluses, as the task can’t be left to politicians. ”That would be no more appropriate than it was when Howard and Costello and Rudd and Swan did it. It would put upward pressure on inflation and interest rates,” says Eslake, who has been arguing for a fund since 2005. Besides economists, many non-resources businesses are also keen on a fund to shield them from the ”resources curse”, a hollowing out in other parts of the economy as mining expands its share. The Australian Industry Group, for instance, is investigating whether a fund can help protect manufacturing exporters from the higher dollar, which erodes export earnings. AI Group’s public policy director, Peter Burn, points to Norway’s fund, which has a mandate to buy overseas assets with oil revenue as a way of dampening the effect of a soaring exchange rate. ”A sovereign wealth fund financed from the boost in revenue at times of high commodity prices would assist in stabilising the macro economy and, if the fund purchased offshore assets, could also dampen the exchange-rate impacts of booming commodity prices,” Burn says. Top executives have also weighed into the debate. Chief executives from Commonwealth Bank, ANZ Bank, Tabcorp, Foster’s, CSL and Coca-Cola Amatil and Orica and chairmen from Mirvac, Gloucester Coal and Pacific Brands have also backed a fund with the objective of saving or stabilisation. The idea is also grabbing attention in Canberra, after the Liberals’ Malcolm Turnbull recently backed calls for a national fund. He thought the stabilisation goal of Chile’s fund was probably appropriate, but said the fund could also earmark funds for ”very long-term savings”. Support for a fund is not universal – former Treasury secretary Ken Henry said last year that greater saving and smoothing the boom-bust cycle could be achieved ”within the overall budget strategy”. Free-market think tanks such as the Institute for Public Affairs say the government should return commodity wealth to the people through lower taxes. Reserve Bank governor Glenn Stevens has raised the prospect of a ”stabilisation fund” without supporting the idea, and Treasurer Wayne Swan has not ruled it out. ”If we were in the position of not only coming back to surplus but coming back to a position where we had no debt, then maybe that would be an option,” Swan said in December. Despite this growing support for a fund, public debate has largely steered clear of how one might be designed. Treasury documents released under freedom of information suggest the government is lukewarm on a Norway-style fund, which invests all of its $US560 billion overseas. Private-sector economists agree an Australian fund would have less need to invest all the assets overseas, as the potential damage from price swings is less here than in Norway. However, a fund could not avoid being a significant investor overseas. ”Australia is a very small part of the global financial market, so inevitably investing overseas is going to be a very important part of the strategy,” says Gordon Clark, an Oxford University professor who specialises in sovereign wealth funds. Whether a fund should deliberately try to restrain the surging dollar to help certain industries, however, is more contentious. A former deputy governor of the Reserve Bank, Stephen Grenville, has cited sovereign wealth funds as one way of tackling the hollowing out of manufacturing caused by the dollar. Dr Grenville has argued that if this is the goal the investments would indeed have to be in foreign assets. The Australian Industry Group has also found that Norway’s manufacturers have fared better than others in Europe. But HSBC’s chief economist, Paul Bloxham, says suggestions that we follow Norway by trying to ”ring fence” commodity earnings are ”radical”. Fraser also warns against trying to manipulate or manage currencies through a fund. ”The magnitude of any sovereign wealth fund are peanuts to the volumes of money that float around on the foreign exchanges,” he says. Wherever its assets were held, an Australian fund would be under pressure to adopt a conservative investment strategy, given that key sovereign funds suffered heavily in the global financial crisis. Singapore’s Temasek fund and Norway’s long-term savings fund – both of which invest heavily in shares – lost more than 20 per cent in 2008. Shorter-term stabilisation funds of Chile and East Timor, which hold mostly bonds, held up positive returns throughout the financial crisis. How to spend the money is also up for debate, but an early favourite is infrastructure. ANZ’s chief executive, Mike Smith, echoed the thoughts of many economists when he said funnelling a fund’s earnings into the nation’s creaking infrastructure would be a ”sensible idea”. The Grattan Institute’s Eslake adds that a fund could support spending on social infrastructure that politicians tend to ignore, such as aged care or indigenous affairs. However, he says that strict rules would be needed to ensure the money was spent at the right time.”You structure it so that the government can access the income produced by this fund but not the capital until such time as when the mining boom is ‘over’,” he says. Turnbull also concedes that politicians have a ”very strong temptation to splash money around” – often with tax cuts at the peak of the boom, when they are needed least. Any fund would also need a healthy degree of separation between the fund and the elected government. According to Oxford’s Professor Clark, the worst performers tend to be those governed by people too close to their political masters. In a sector that is notorious for being opaque, most agree the Future Fund has set the bar high for independence under the outgoing chairman and frequent government critic, David Murray. Shielding Australia from the commodity bust-and-boom cycle is a worthy goal – most agree on that. Saving more for future generations also has widespread support. Interest rates and budgets will probably remain the main policy ”levers” for these tasks, but there is also growing support for some sort of sovereign fund, as has occurred overseas. After observing other countries’ experiences, however, a key lesson seems to be that Australia’s situation is distinct, given our wide range of natural resources and their long lifespans. Eslake says this means we should be flexible in designing a fund that suits us, not simply copying resource-rich countries. ”Although our circumstances are in some ways similar to Chile and Norway, the fund itself is more like the Chinese one,” referring to the $US330 billion China Investment Corporation, which has a wide-ranging portfolio of bonds, shares, and strategic stakes. For all the interest in a sovereign wealth fund from business leaders, however, they have artfully ignored an elephant in the room. As Bernie Fraser points out, a government is unlikely to embark on this path until it is confident that it can extract more tax from a booming economy, and last year’s mining tax brawl showed just how hard this is. You are currently browsing the archives for the WORLD WEALTH category.